Open Social: We open to the general public once a month, in February it’s Saturday 16th, from 7-ish until the last one leaves. Want to know a little more about what we do? Want to join in? Come along, bring yourself, food, drink, ideas, chat. Lock Picking: Our regular lock-picking night runs every other Monday, come along and learn how to pick a padlock. Or handcuffs, should you need. No questions asked. 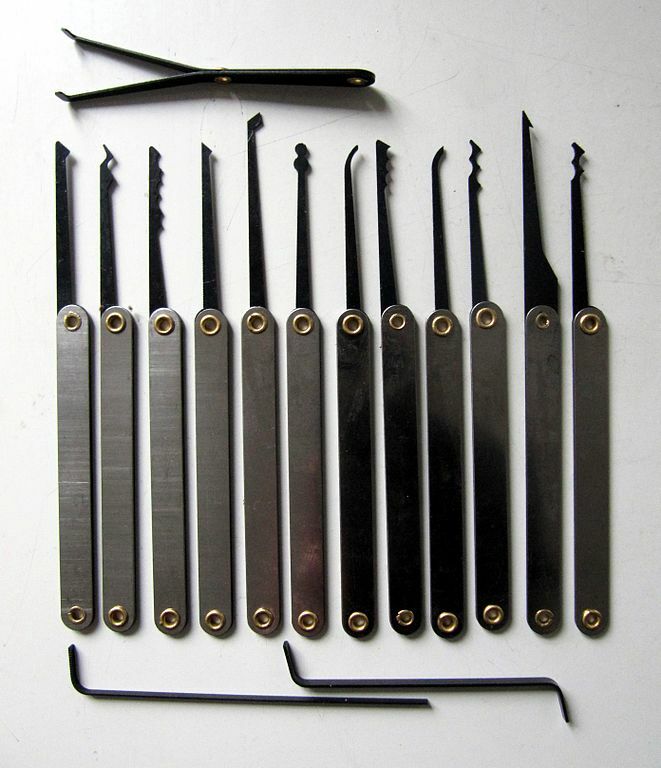 This month, lock-picking is on the 4th and 18th February, starting at 7 pm. Tools provided. Craft Night: Craft night involves knitting, sewing, crochet, embroidery, CAD and 3D printing, all under one roof, all at the same time. Or anything else in the craft line that you’d like to do. Every second Wednesday, this month that’s the 6th and 20th February. 7 pm start. Electronics and Micro Controller Night: Anything electronic, micro and hackable. All levels from beginners to experts, we have basic kits to get you started. Every Monday when there’s no lock-picking, the 11th and 25th February. Bring your own laptop. Starts at 7 pm. Coding: Runs on the same Mondays as lock-picking, the 4th and 18th at 7pm. Come down and work on a project or help others with theirs. Laptop of your own pretty much essential, and bring your own side project. Wikipedia Editing: is a great chance to learn how to edit Wikipedia, every last Wednesday of the month (27th February). Bring your laptop, there may be pizza! 7pm onwards. The Science Fiction Book Club This month’s epic blockbuster is The Stars My Destination by Alfred Bester. It’s short. If you think too short, come and rant about it. If you think mercifully short, come and rant about it. Wednesday 27th February, 7.30 pm. This was written by Joe Citizen. Posted on Monday, February 4, 2019, at 7:58 pm. Filed under 3D printing, Advocacy, Arduino, book, Calendar Event, Coding, Craft, Lock Picking, News, Open evening, Social Night, Uncategorized, Workshops/Events. Tagged book club, Coding, crafting, electronics, February 2019, lock picking, lockpicking, open event, social night. Bookmark the permalink. Follow comments here with the RSS feed. Post a comment or leave a trackback.